A Technical SEO Audit (Search Engine Optimisation), provides the benchmarking and analysis of the current performance level of your website against a detailed list of online marketing criteria. This is a comprehensive and detailed technical diagnosis of your website performance, particularly in how your website compares against your selected local industry competitors in your vertical, and determines what is impacting upon its ability to rank highly for your desired keywords in the SERPs (Search Engine Results Pages). This report can form the basis of determining priorities of what needs to be resolved on your website and to determine the prioritised to-do list for the teams working on the resolution of the identified issues. An executive summary report will bring together all of the data points that will be supplied to you for your reference, and highlight the recommended strategies to improve your website usability, performance, functionality and search engine visibility. Search Group is able to provide a range of advance marketing reports covering traditional and online marketing areas of your business which include; scoping, SWOT analysis, competitor analysis, ideal customer persona identification, email marketing review, direct marketing review, focus groups, PPC Google Adwords reviews and Social Media reviews. The advanced Technical SEO Audit can also be supplied with a quote to cover noted outlined issues for ad-hoc resolution by the Search Group team, or recommendations on appropriate marketing plans by Search Group to address the resolution of the issues within suitable ongoing SEO project plans. 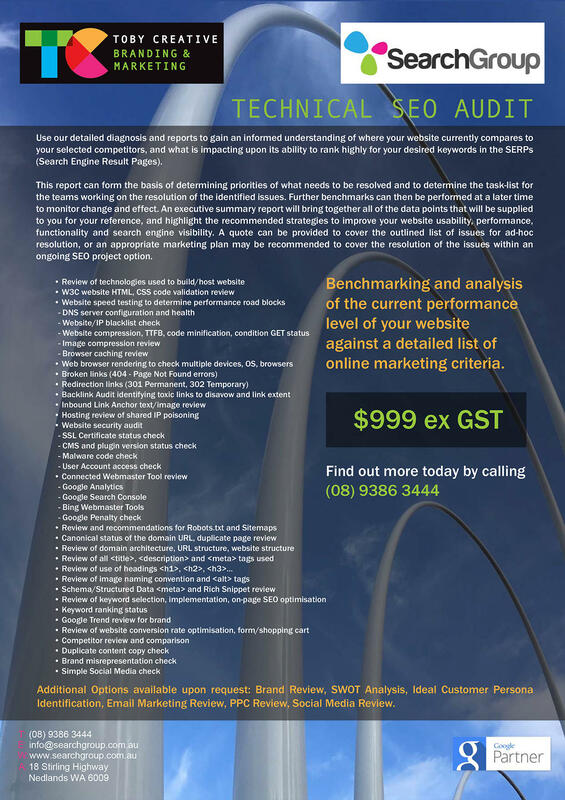 Download or print-out, our Search Group Technical SEO (Search Engine Optimisation) Audit brochure, then either call us on (08) 9386 3444 to book a no obligation free initial consultation at your location so that we can discuss your specific requirements, or fill in our contact form on this page to send us your details and we’ll contact you back. Ask for our FREE website SEO report to find out the current status of your website and which areas can be improved. View how Search Group works with a New Client in our Kick-Off Meeting Process to find out about the steps for new clients in our kick-off meeting to start your new SEO marketing project with our Perth SEO Agency. View our Search Group SEO Process to see how our Perth SEO Agency engages with new SEO clients, the steps that we take with our client engagement process, the monthly SEO tasks performed and SEO reporting cycle.